John, Tom, Claire and Ian ready for the start. Now before readers say how can there be a tour around the world in one day? Just read on and find out. At the planned start time of 10:00 there were three bikes ready for the run (others were obviously still going to do theirs runs on the Sunday – the official day). 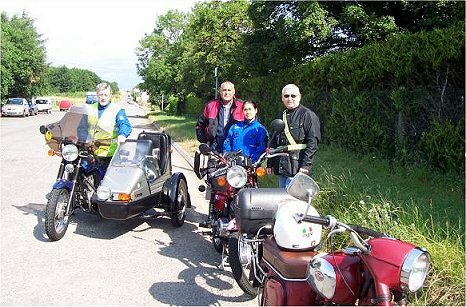 John Kennedy with his 350cc Jawa Blue Style with Velorex sidecar; Tom Soffe and his daughter Claire with their CZ 180cc [by the way it was also Claire’s 14th birthday] and myself with my old Jawa 350cc. With John leading the way and me ‘tail end Charlie’ we set off on our run with the weather warm (about 22°C), but mostly overcast and quite breezy. 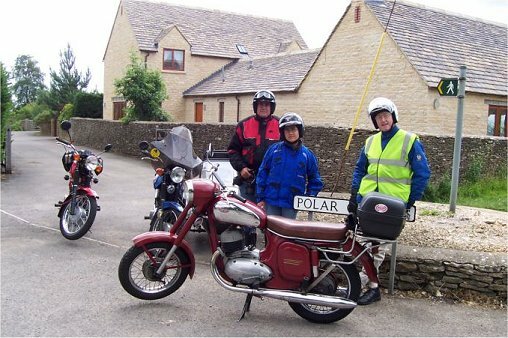 First World Tour stop - Polar. We first headed along Tadpole lane north of Swindon, passing the Swindon & Cricklade Steam Railway depot (well worth a visit if you’re into steam locomotives) before getting to Purton. From here we then went towards Wootton Bassett before turning off to travel on the B4042 to Malmesbury. 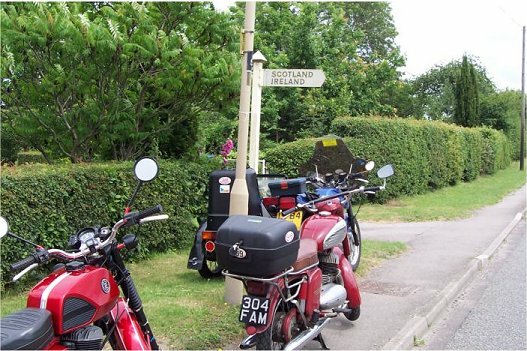 This is a nice road with plenty of sweeping bends, and before Malmesbury you pass through what is reputed to be the longest village in England – Brinkworth, a unique sort of place many miles long but with virtually no depth. On entering Brinkworth there is quite a long downward slope and it was here that we met up with a cyclist who was doing about 35 mph. As it was a 30 mph limit area I thought it was my duty to point out to him that he was speeding (in a jokey way of course), he have me the thumbs up sign and said ‘thanks’, as he did wonder what speed he was doing!!! Second World Tour stop – Pennsylvania. At Malmesbury we passed the headquarters of the Dyson factory (of Vacuum cleaner fame) before heading off along a scenic road to the picturesque village of Sherston. The road as it leaves the village market square narrows, and due to some road works traffic signals had been set up to control traffic. The lights were red as we arrived, but as we waited all of a sudden they went off. At that very moment a car pulling a trailer came through from the opposite direction, and it had the temporary traffic light cables wrapped around one of the trailer stabiliser legs that had somehow dropped into the lowered position. The guy had taken out the whole of the traffic signal set-up. We cautiously edged our way through the narrow road section, leaving this guy to sort out the ensuing traffic chaos he was about to cause. It was now on towards Acton Turville, but before getting there we stopped in a small hamlet for our first photo shoot. Here there was a place called ‘Polar’, the first point on out mini world tour. Third World Tour stop – Scotland & Ireland. Our next stop was in a rest area on the A46 to Bath road. Here we stopped for about 30 minutes before setting off a few miles further down the road to another small hamlet called ‘Pennsylvania’ – the second of our mini world tour points. So we’ve now travelled from Swindon to the Polar area and to the USA. The two Jawa’s and the CZ now headed into the city of Bath (a World heritage city), but with no time for sight seeing, we continued on to our next rest stop just south of Bath at the beautiful Kennet & Avon canal. Here we had a further rest stop and the chance to stretch our legs by walking up to the canal and taking some refreshments in the small café there. John stayed with the bikes and had his packed lunch. It was then time to head south again before turning left onto the A361 heading back towards Trowbridge. It’s along this stretch of road that we stopped for our next world tour stop, and that was to both Ireland and Scotland. This is just a small collection of houses with this unique postal address. After a few more pictures it was again off on our way to Melksham, Calne and then towards Lyneham (home to the large transport fleet RAF base). Just before Lyneham was our last photo stop of this trip, and that was to ‘New Zealand’, this recorded it was then back home to Swindon. Final World Tour stop – New Zealand. 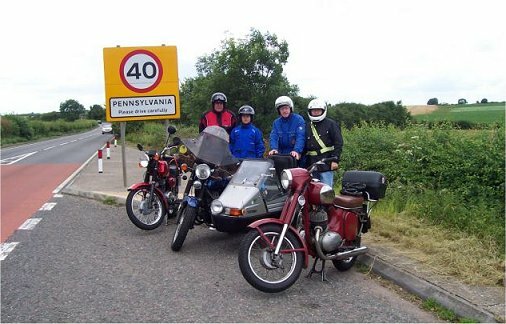 In all from leaving home to returning, the old Jawa and myself had covered 110 miles (John and Tom would have done more by the time they got home), and it had been a really enjoyable days riding. The map below shows the circular route we took. 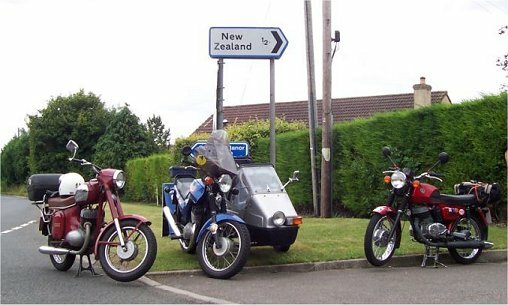 OK, so it wasn’t a real world tour, but with International Jawa/CZ day being a world wide event, it seemed appropriate that we do something along the theme. It was an enjoyable ride though, with all of the bikes performing faultlessly and enhancing the Jawa/CZ reputation. Thanks to John for organising it. Ian Bridge. From Swindon Smoke Signals – with thanks.